Posted April 5th, 2019 & filed under News. 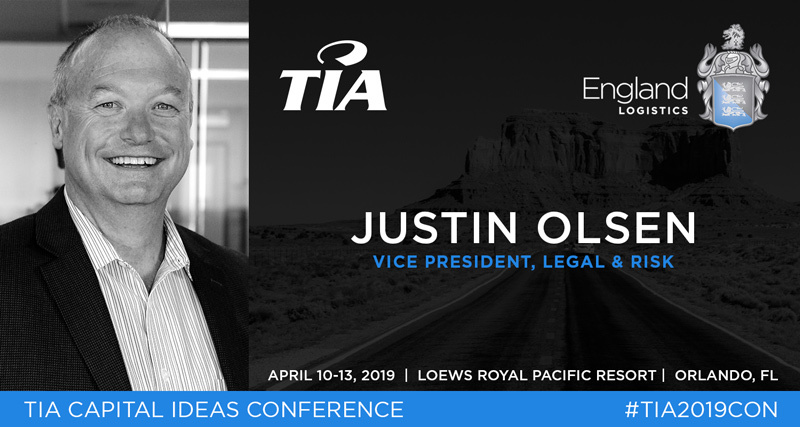 SALT LAKE CITY, Utah, April 5, 2019 – Justin Olsen, vice president of legal and risk management at England Logistics, will join other brokerage-based logistics professionals as he presents at the TIA 2019 Capital Ideas Conference & Exhibition in Orlando, FL. This annual conference will consist of educational sessions, including best practices for managing business relationships and tips for legally protecting companies in the 3PL industry. Olsen holds several years of experience in the logistics industry as in-house counsel. He will draw on this experience during two presentations at the TIA Capital Ideas Conference & Exhibition. Olsen’s first presentation will take place on Saturday, April 13 from 8:45 – 9:15 a.m. and is titled “Factoring Law – Payment Rights, NOAs, Double-Payment, Etc. Lean Staffing Learning Lab.” For his second presentation, Olsen will be joined by Eric Arling, director of operations at Integrity Express Logistics, and Kent Britt, partner at Vorys, Sater, Seymour and Pease LLP. Their presentation titled “Restrictive Covenants: What They Are, How They Work, and Why You Need to Know” will take place on Saturday, April 13 from 2:00 – 3:00 p.m.
For a complete view of the TIA Capital Ideas Conference & Exhibition agenda, please visit www.tianet.org. England Logistics offers a vast portfolio of non-asset based transportation solutions including full truckload services, intermodal, dry and cold chain LTL, parcel, global logistics, and complete supply chain management. England Logistics is an equal opportunity employer offering competitive opportunities to qualified candidates. Headquartered in Salt Lake City, Utah, the company also has offices in Ogden, Utah; Atlanta, Georgia; Detroit, Michigan; Greeley, Colorado; and Portland, Oregon. To become part of England Logistics’ team call 866-476-7012 or visit http://www.englandlogistics.com.